Congratulations! Now that you’re engaged, it’s time to start planning your wedding. We know planning your wedding can be a little overwhelming, especially in the beginning. Where do you start? Who do you call first? The average amount of time couples spend planning their wedding is 13 months, so we setup this timeline to reflect that time frame in order to make planning your North New Jersey wedding easier and less stressful for you both. Keep in mind… it’s all in the details! Wedding Planner: There are a lot of benefits to hiring a wedding planner. 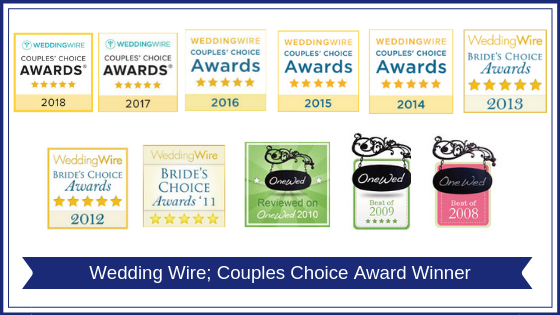 If you’d like to hire a full-service wedding planner or day of coordinator make sure to book him or her as soon as possible especially if you’ll be getting married in the popular months of April, May, or June. Venue: Whether you decide to have separate ceremony and reception venues or host your wedding all in one location, it’s best to book your venue or venues as soon as possible. And if you’re booking an all-inclusive venue, other vendors like your caterer and rentals may also be included, which can save some time. Photographer: We all know that wedding photographers play an essential role in your big day—so be sure to allot enough time to ensure you have lots of photographers to choose from. Videographer: Your wedding videographer will create a cinematic film of your wedding day, featuring motion and sound—an essential memento of your wedding day. Videographers tend to book up early so it’s best to start searching for one sooner rather than later. Florist: Are you in love with all those gorgeous flower arrangements you’re seeing all over Pinterest and Instagram? Find a florist whose work you love and who seems to best understand your wedding style, vision, and budget. Caterer: If your wedding venue doesn’t include a caterer, you’ll need to include an outside caterer in your wedding vendor timeline. Your caterer will help you decide on your reception’s serving style as well as provide a pre-wedding tasting to help you pick out specific dishes. Reception Music: Whether you choose to hire a wedding DJ for example like Create Excitement or a band be sure to allow ample time to find a wedding entertainer that you love—whether it’s a DJ with a great personality and playlist or a band that has a fantastic sound. Ceremony Music: When it comes to ceremony musicians, you have lots of options—from a solo musician like a harpist or guitarist, to a group like a string quartet or jazz band. However, make sure to book him or her early as these vendors typically book up well advance also. Guest Accommodations: If you’re hosting a lot of out-of-town guests, we recommend booking a block of rooms at a few hotels near your wedding venue. Be sure to list hotel room block information on your wedding website or on your save-the-dates or invitations. Officiant: Whether you are marrying in a religious or secular ceremony, it pays to hire an experienced, professional officiant who can help you craft and execute a meaningful and personal ceremony. Wedding Dress: Allow yourself ample time to shop for a wedding dress (the average bride tries on between four and seven dresses before finding “the one”), and don’t forget about alterations! Stationery: If you’re hosting a destination wedding, we recommend sending out save-the-dates as soon as you have your wedding location booked (more like a year in advance). If your wedding is closer to home, eight months in advance is an appropriate time frame. Wedding Cake: It’s best to book a baker far in advance if possible. Once you’ve selected your cakery, make sure to schedule a tasting to pick the flavors for your wedding cake. Bridesmaid Dresses: While bridesmaid dresses don’t take as long to order as a wedding dress, they can take months to arrive. Visit bridal salons with your bridesmaids to come up with a look that you can all agree on. Honeymoon Travel Consultant: No matter where you decide to travel, include a honeymoon travel agent in your wedding vendor timeline who can help make planning your trip of a lifetime a breeze. Wedding Invitations: While you don’t have to send your wedding invitations until six to eight weeks before your wedding, ordering the invites themselves from a stationery shop can take quite a bit of time. Makeup Artist: A professional makeup artist can ensure that you’ll look your best on your wedding day—both in person and in photos. Don’t forget to schedule a makeup trial a few months before your wedding as well. Hair Stylist: Whether you’re going for an elegant updo or loose locks, a wedding hair stylist can create a gorgeous look that will last the whole day (and night!). As with a makeup artist, you’ll want to schedule a hair trial before your wedding too. Rentals: If your venue does not provide rentals like tables, chairs, linens, china, flatware, etc. or if you’d like more options, you’ll need to hire a rentals company as part of your wedding vendor timeline. Work with your caterer, venue, and florist to ensure that you rent the items you need, in the proper quantities. Men’s Attire: Suit or tux? To rent or to buy? Whatever you decide, you’ll want to lock it down a few months before your wedding day. This goes for both groom and groomsmen—you can often receive discounts if you rent or buy your attire at the same time. Accessories: Veils, headpieces, shoes, undergarments, and more—be sure to purchase any wedding-day accessories you’ll need with enough time before your wedding day. Brides will want to purchase shoes and undergarments so that they can have those accessories on hand for their first fitting. Transportation: Hiring a wedding limo, shuttle bus, or other transportation is a good idea to ensure that your day runs smoothly and everyone arrives safely and on time. Finding a reputable transportation company to help you with all the logistics is an important part of your wedding vendor timeline. Favors: The wedding party and guest favors you choose should reflect your wedding style—and there are lots of great ideas to choose from! Be sure to purchase your wedding favors with enough time to allow for any personalization or special packaging. Wedding Rings: Your wedding band is a piece of jewelry that you’ll wear every day for the rest of your life, so take your time shopping for your bands. Remember to apply for your marriage license. Finalize the guest list. Determine seating chart. Buy a guest book and other wedding day accessories. Confirm honeymoon reservations, wedding cake order, florist, venue, officiant, and all other vendors for your wedding day. Or if you have a wedding planner, make sure he or she confirms all vendors.